The Novium Museum in Chichester has been awarded a grant of £10,130 from Arts Council England to run this year's Chichester Roman Week. 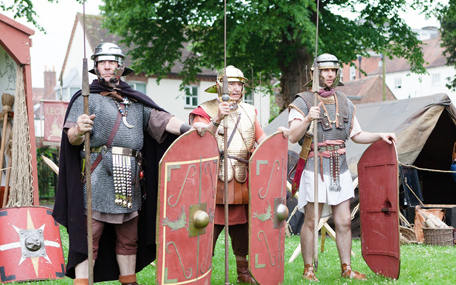 Chichester Roman Week takes place every May half term and celebrates Chichester's rich Roman heritage, with a programme of events designed to engage visitors of all ages taking place in and around the district. The grant funding will help to build on the success of last year's Chichester Roman Week, which was awarded a coveted Bronze award in the category Tourism Event of the Year at the Beautiful South Awards 2018. This year's event will run from Saturday 25 to Friday 31 May, with an extensive and varied programme of events taking place. This will include the headline Roman Re-Enactment in Priory Park on Tuesday 28 May which will take place from 11am to 4pm and will be free to attend. Last year's interactive re-enactment attracted more than 2,000 visitors over the course of the day and included a military show, slave auction and the show-stopping Gladiator Battle finale, which invited children from the audience to take part. "Chichester Roman Week is growing in popularity year on year, and this generous funding by the National Lottery through Arts Council England will ensure that this year's event will reach more people than ever," says Councillor Eileen Lintill, Cabinet Member for Community Services at Chichester District Council. "We hope that the exciting programme will encourage visitors to visit The Novium Museum and other sites across Chichester this May half term." As well as the Re-Enactment, other events taking place throughout the week include workshops, talks, tours and craft activities. Stephanie Thorndyke, Manager of The Novium Museum and Chichester Tourist Information Centre says: "By taking our museum practice into the city, Chichester Roman Week will engage local residents, families and visitors to the area with the museum's Roman collections and our fascinating Roman heritage." Other venues running Chichester Roman Week events include Pallant House Gallery, Chichester Festival Theatre, Chichester Library, Bignor Roman Villa, Butser Ancient Farm, and Fishbourne Roman Palace.